While yesterday was a day of redwood forests, today was a day of sand dunes. 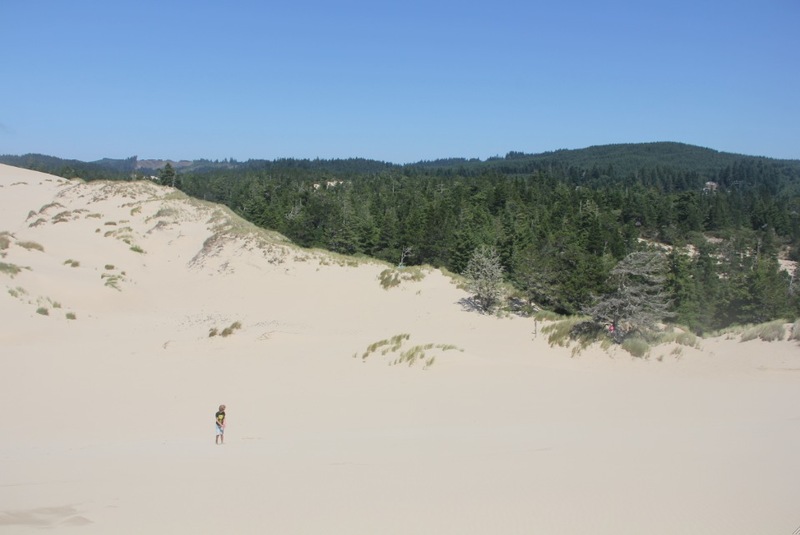 For some reason that no-one can explain adequately to me (not even Wikipedia), the Oregon coastline has 50 miles, or 32,000 acres, of rolling sand dunes right next to the ocean. The best explanation for it that I’ve heard is “wind and rain erosion, duh!”, which doesn’t cut it for me. Why here? Why just 50 miles’ worth of dunes if it’s caused by wind and rain erosion? Is there really no wind and rain erosion anywhere else on this coastline? Duh? Regardless of their origin, the dunes have provided heaps of fun today for Family Gotts. This morning we found a trail that led around a forested duney loop and onto the dunes themselves. Mad Max, aka “the nutcase”, filled his hair and every orifice with sand by rolling around in it. 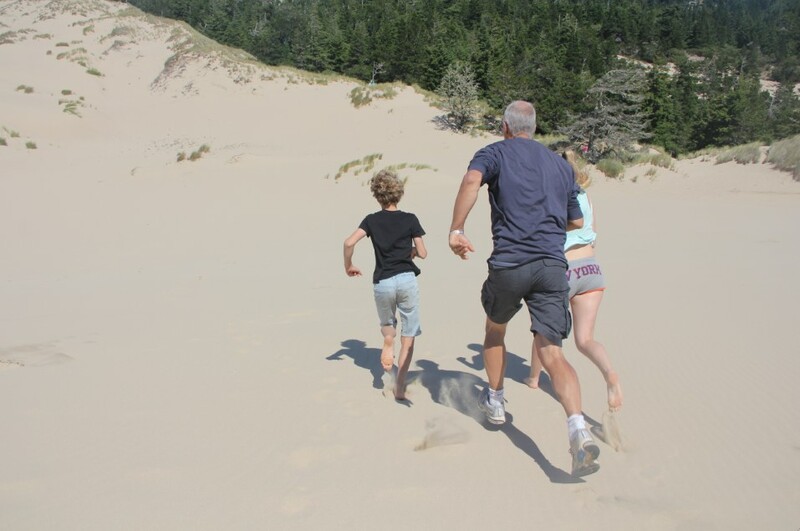 The rest of us merely ran down the dunes as fast as possible and wondered at the weirdness of having dunes abutting conifer forests. It’s impossible to tell who’s who behind all the sand-proofing clothing, but Max is at the front in green and the rest of us are in the row behind him. 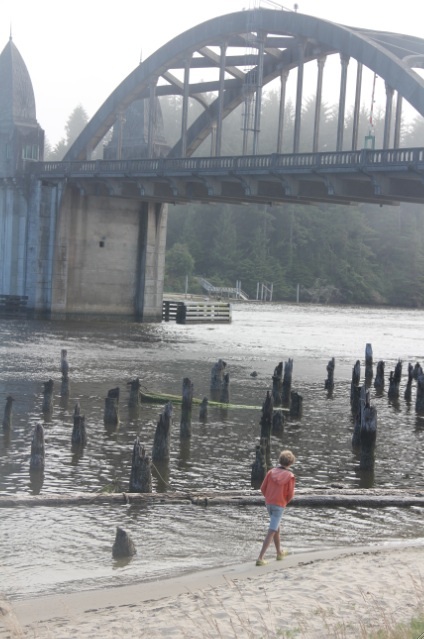 After an hour wandering around the cute town of Florence and admiring its Siuslaw Bridge, we joined a dune buggy tour. 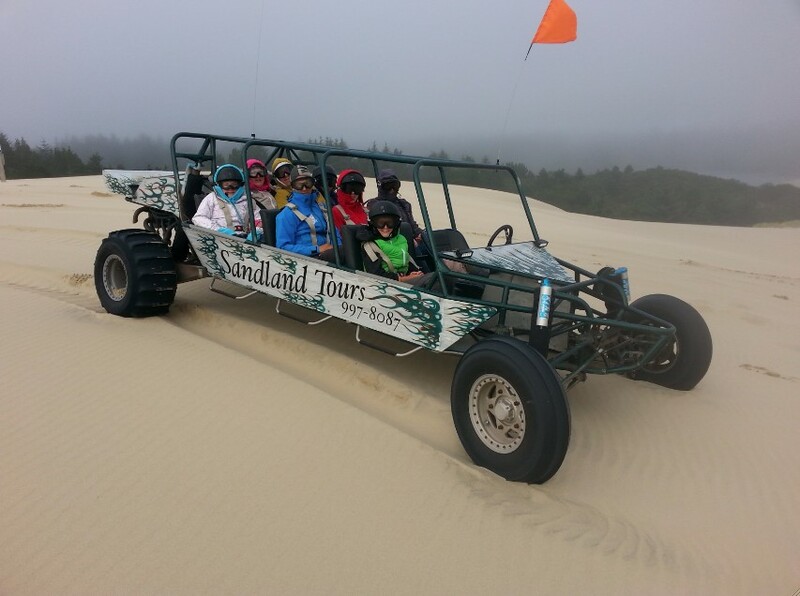 This involved whizzing around the sand dunes at high speeds for 30 minutes on an adrenaline-filled ride, incidentally using vast quantities of sand to clean our teeth and exfoliate our skin. The buggy tour showed us just how enormous the dunes area is. My sense of direction is so appalling that I wouldn’t have recognised a trail anyway (and since the dunes are always changing shape, I don’t know how our driver knew which way to go either), but even so, there seemed to be no end to the sabulous hillocks. They went on and on in every direction. The fog that coated the dunes added to the sensation of endlessness.